4. and most of all, memorize how to play each mode! Lyle: As you listen to this first audio sample, Here's an audio sample where I'm playing all 7 modes, one at a time, against a jam track that is in the key of E. Notice how the "flavor" or tonality changes about every 8 bars or so. That's because each of the 7 modes has its own unique sound. This is why it's important to learn Modes so you can expand your own sound. 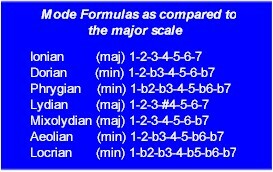 Lyle: In the chart you'll see that the first mode, Ionian has scale tones from 1 to 7, which is the major scale. The 2nd mode, Dorian, starts on the 2 degree of the same scale and ends 1 octave higher than where it started. All the modes work this way. Even though they all use the SAME notes of the original major scale, they will have a different placement of the whole step and half steps within creating a different sound. Lyle: Here's the first mode, the E Ionian. This is the E major scale. Ionian is the major scale. Formula: 1 - 2 - 3 - 4 - 5 - 6 - 7 degrees of the major scale. Lyle: The purpose of you doing this is to become familiar with the mode pattern and the unique sound it has. Lyle: Now you'll learn the E Dorian mode. The Dorian is a minor scale built off the 2nd degree of a major scale. Formula: 1-2-b3-4-5-6-b7 as compared to a major scale. Now learn these next two tab patterns for E Dorian. Lyle: Listen to me playing these two patterns with this jam track. Lyle: Note" The E Dorian mode is the 2nd mode in the D major scale. Lyle: The next mode to learn is called the Phrygian. Like the Dorian, it too is a minor mode. The Phrygian is built from the 3rd degree of a major scale. So the E Phrygian is the 3rd mode of the C major scale. Phrygian: 1-b2-b3-4-5-b6-b7. Learn these two patterns for E Phrygian, then play them against the same jam track you just used for the Dorian. Lyle: Listen to this sample of me playing the E Phrygian. You'll notice how strong a "minor" sound it has. Lyle: The next mode, built off the 4th degree of a major scale is called the Lydian mode. It is a major type of scale. So the E Lydian is the 4th mode of a B major scale. The Lydian is: 1 - 2 - 3 - #4 - 5 - 6 - 7. The only thing different between the E major scale and the E Lydian is that the E Lydian has a #4. Here's two tab files of the E Lydian. Lyle: Listen to a sample of me playing these two patterns together. Lyle: In the sample at the very beginning of this lesson, you can hear me playing all of these modes back-to-back. Once you have memorized all of the patterns from above, try playing them along to either one of these jam tracks. Lyle: You should become familiar with each of the mode names, formula, which degree the mode comes from within the major scale and the sound that makes each mode unique.